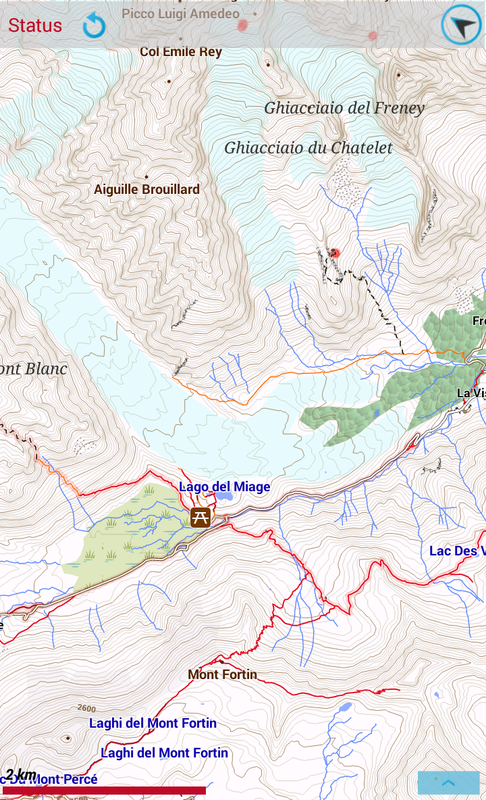 Tiramisù is a MapsForge theme built to style the maps from OpenAndroMaps in Oruxmaps and compatible apps. The theme, just like the maps, has a strong focus on hiking and general outdoor use, showing not only paths and tracks, but land use, water and food sources, and accommodation as well. 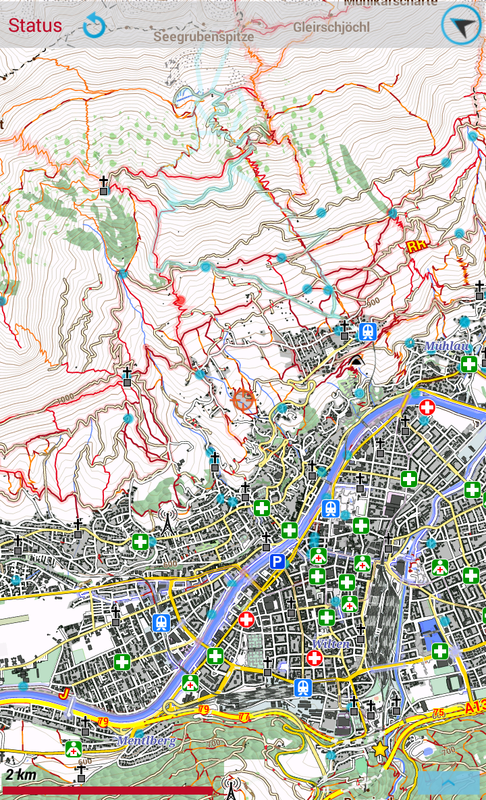 Taking advantage of the latest MapsForge features Tiramisù has three built-in styles, for hiking, mountain biking and road cycling that can be fine tuned to suit individual needs. OpenandroMaps are based on OpenStreetMap data, which is full of good stuff but it’s still far from perfect with incomplete areas and sometimes wrong information. 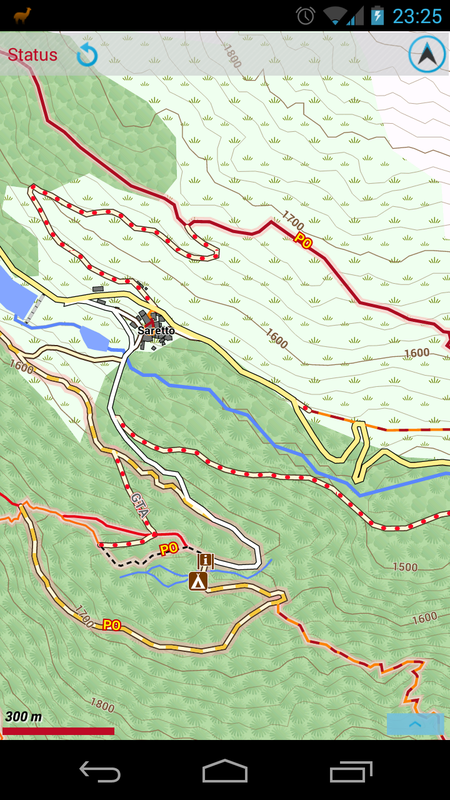 Contour lines come from other sources and aren’t always super precise: while generally adequate for hiking and cycling they can sometimes be insufficient for alpinism. There are also visible junction problems at tile borders. While things generally work well enough, there may be situations where wrong data or a wrong interpretation due to bugs in the theme can lead to dangers. You are responsible for yourself, please don’t blindly trust the maps. A few particular notes about paths. 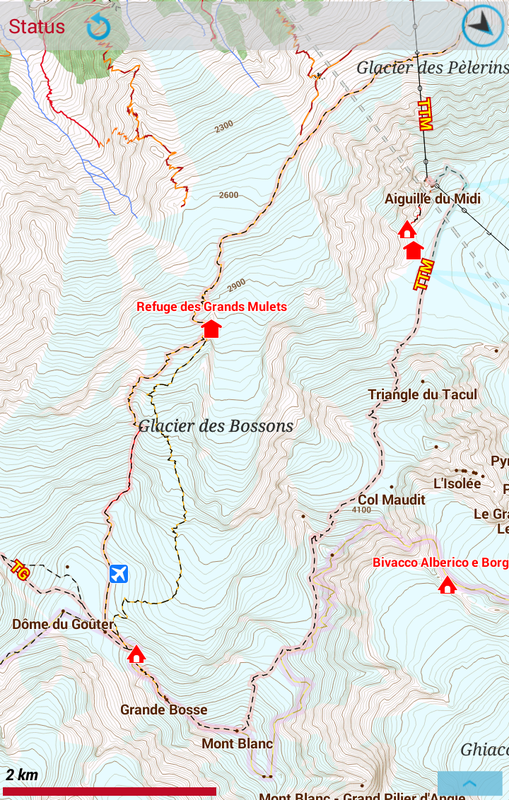 In hiking style, difficulty level is shown according to the Swiss Alpine Club (SAC) scale. If you are not familiar with it I strongly suggest to read the difficulty description on the OSM site. Please note that the T4-T6 range is not really hiking but rather alpinism (use of hands, if not ice axe, crampons and rope, is necessary to go ahead). Do not take this lightly. Be careful, and gather as much information as you can from other sources before you go onto those paths. As far as MTB style is concerned the difficulty scale is derived from the Singletrail-Skala, with some guesswork when data is absent (notably for the uphill on paths). The theme is released under the CC license: use it, hack it, share it, it’s free. However, if you like it and use it, I kindly ask you to donate a few Euros to the OpenandroMaps project so that Christian can continue to give us this fabulous tool. Building and serving the maps costs a lot, really. The current recommended version for Oruxmaps 6.5 and other Mapsforge 0.5 apps (which at the time of this writing means Cruiser, basically) is Tiramisù 3.0.1. Download it and follow the standard instructions at the OAM website. On most devices it should work out of the box, except for icon size that will be right only on 300 dpi devices. You can set a scaling factor in the Mapsforge preferences (Settings->Maps and scroll way down) to suit your need/tastes. If that’s too complicated then try the Offline Map Downloader that allows you to install the theme with a few taps on the screen. Due to hosting issues I can’t use the new direct install feature of Oruxmaps, sorry. I’m keeping the older version available for those stuck with apps that use the 0.3 and 0.4 Mapsforge library. Choose the version that’s closer to your display dpi. First download the appropriate theme files below. You can also download the old PDF legend, optimized for phone displays. I suppose that the maps are intuitive enough, but still… you may want to save it somewhere on the phone for quick off-line access. Then check the default zoom level (Settings->Maps->Zoom settings->Default zoom) and set it to 100%. Some Oruxmaps versions have the arguable feature of setting it to higher values by default on high density displays. This makes a lot of sense for raster maps, but makes vector ones look jagged, so you really should set it back to 100%. You can download the Inkscape SVG files with all the symbols and patterns used in Tiramisù. The files are set up to allow batch export of all the icons at once using the technique explained by Bulia Byak in this forum thread. I strongly recommend to read and understand that before touching anything since it’s easy to break it by mistake. Note that the boxes on the “Name boxes” layer must be set to full transparency before exporting, the colour is to make them visible during editing. Great theme! But there seems to be missing something for long distance MTB trails. 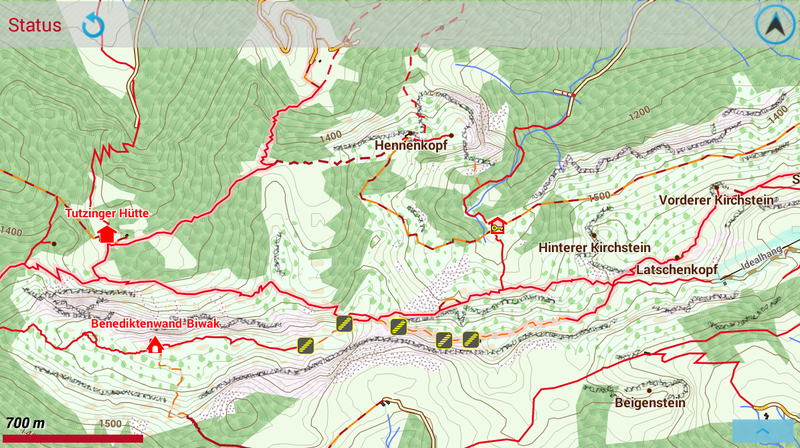 With Elevelo or Elements Country I can see both the Munda Biddi Trail (MTB trail) and Bibbulmun Track (walking track), in different colors and marked MBT and BT, but with Tiramisu only the BT track is shown. Except for that little detail it’s perfect! In the first preliminary versions I tried to support cycle networks and MTB scale but eventually decided against it. The problem is that there are hiking, cycling and MTB networks, and each of them has local, regional, national and international variants. I think you can’t really show 12 kind of networks and still have a readable map, especially since the same path/road may belong to more than one category. So I decided that for now Tiramisù is an hiking-only theme, even if, ironically, I mostly use it while biking. 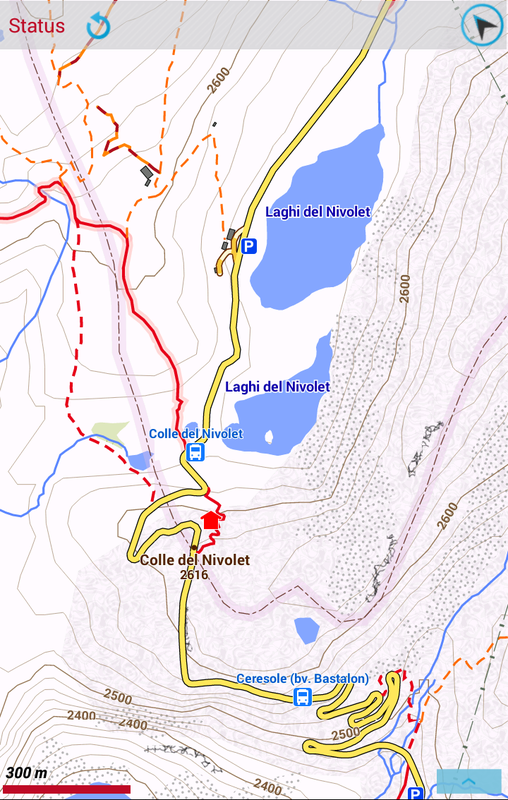 Currently only hiking networks are shown with no distinction between local, regional and such. That’s not the only limit. Since this is mostly my personal theme, built for my needs, it is optimised for usage in mountain areas. In flatter, wider areas (Iceland) it clearly doesn’t work well. Contour lines, for example should be shown earlier. But I had to make compromises. The upcoming Mapsforge version (0.5) will add a lot of new features that will help sort this stuff out. I have some ideas, but I have to try them. I hope to have a cycling version for next spring. Yes I understand, good news though that there will be a bicycle theme too! Awesome, thanks. Hi, impossible to download the file. Clicking on the link opens page in Box, listing the file, but from this page, the “download” buttons are not functionning…. If you may have a look. I just did a new test, same issue… Download buttons are “clickable”… but do nothing. Then, due to your suggestion about “particular configuration”, I tried again deactivating all modules / extensions of Firefox… and it worked ! I don’t know which extension is more or less incompatible with Box, but the most important is that I’ve been able to get your theme. Ciao. Se vuoi ospitalità dei file per creare dei link diretti di installazione ti posso dare dello spazio gratuito su un server in Germania con un’ottima banda. In caso scrivimi!